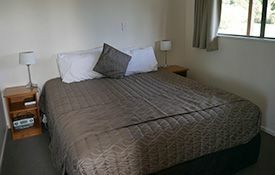 Queen-size or full single beds (no rollaways). Effective wall heaters, with extra blankets and heaters available on request for really cold nights. Fully equipped kitchens, suitable for making a quick breakfast or more substantial dinner. 2 of the 2-bedroom units (rooms 7 and 8) have full ovens. Microwave ovens in all rooms. Ensuite bathroom with powerful showers. Plenty of parking right outside the unit. Vodafone and Telecom mobile reception. Satellite TV (including SKY Sport 1 and 2, SKY Movies and BBC World). Hairdryers and radio alarm clocks. 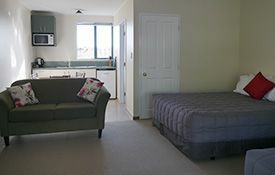 These units have 1 queen-size bed or 2 singles, a spacious kitchen area and an ensuite bathroom. 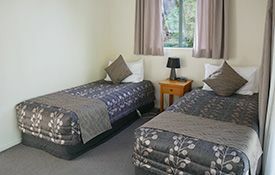 These studios can accommodate up to 3 persons, with a queen-size bed and a single bed in each unit. They have a kitchen (microwave and 2 hotplate rings only) and an ensuite bathroom. A unit with a queen-size bedroom and separate kitchen and living area. Small dining table and a sofa bed, ideal if you are wanting to cook for yourself instead of going out for dinner. Plus an ensuite bathroom. These are our largest units, accommodating up to 6 persons. 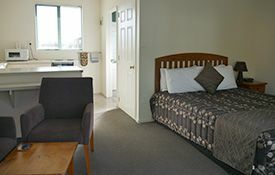 Unit 7 has a queen-size bed and a single bed in 1 room and 3 singles in the other. 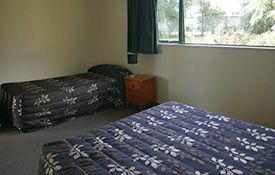 Unit 8 has a queen-size bed and a single bed in each room. 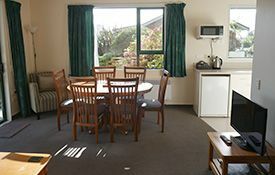 Both units have large kitchens with a full-sized oven, and a dining table and sofa in the living room. Both units have 1 bathroom. They are ideal for larger families or 2 couples travelling together. 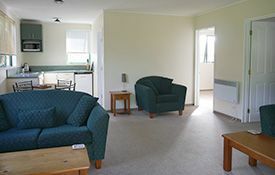 These units each comfortably accommodate 4 persons, with plenty of space for a family of 4. 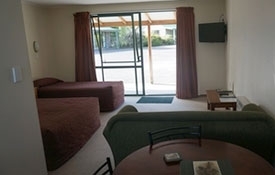 There is a queen-size bed in 1 room and 2 singles in the other, a large kitchen (microwave and 2 hotplate rings only) and living area with a dining table and comfortable chairs. There is 1 bathroom in each unit. 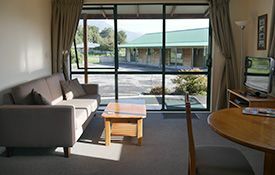 The seasonal price range in Fox Glacier is quite large due to the very seasonal nature of our business. The lowest price is in the middle of winter (August) and the highest prices are from 26th December through to the end of February. Please book online for immediate confirmation. For any other requests, please email us directly for a speedy response. We can provide a continental breakfast to your room on request – $12 per person. Provision of baby cot, highchair and baby bath. We have 2 young children, so can help with child-friendly walks, restaurants and toys to borrow on wet days!